You’ll always be in comfort wearing Carhartt relaxed fit work jeans Classic five-pocket construction. Rivets at stress points. Heavy-duty denim. Imported. Carhartt is the go-to brand for today’s hardest working men Carhartt makes durable work wear workers can count on This men’s Carhartt work henley shirt features a comfortable crew neckline. Long sleeves with rib knit cuffs. Open left chest pocket. Shirt is made of 100% cotton jersey. Imported. 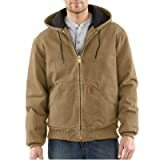 Carhartt’s men’s extremes active jac is arctic-quilt lined for cold weather conditions. Water repellent, it’s constructed of tough, 1000-denier cordura nylon, and fully lined with quilted, arctic-weight polyester insulation. It features two inside pockets, two hand-warmer pockets and rib-knit cuffs and waist. The main seams are triple stitched for strength.